Wed-Mon 11:30 - 3:00 and 5:00 to 9:00 Open til 10 Fri and Sat. Closed Tuesdays. A new conceptual theme, from Chef John McDevitt of Paso Robles, now also Executive Catering Chef of Park Street Kitchen Catering.. Enjoy our ever -changing menus created with the bounty of our beautiful Central Coast. 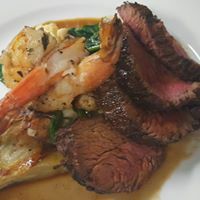 Sourcing from our own Paso Farm, and working with the best of local Seafood and Meat vendors, our Kitchen will entice your palate with unique and satisfying offerings. Much of our menu is an homage to our first adventure as Restaurateurs, at our 10 year stand on the East Coast. We hope you enjoy and that we come to know you well on our corner, with floor to ceiling windows for natural light by day, intimate lighting by night and a sidewalk café to watch the world go by. On the corner of 14th and Park in downtown Paso Robles.